service and worship of the True and Living Yahuwah, and purge all Greco-Roman influences from your lives! Recite all three prayers (below). 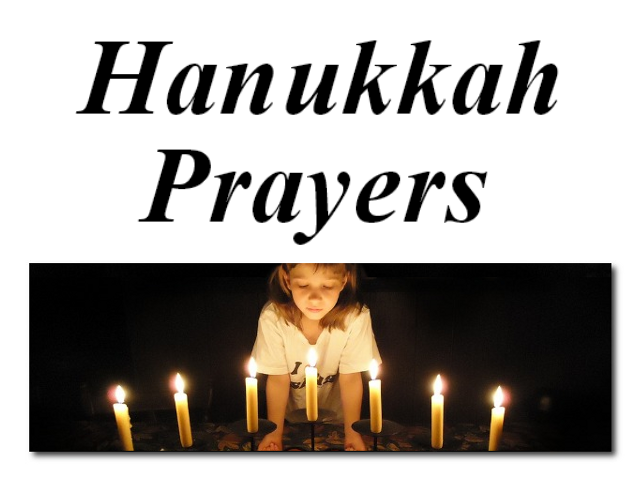 On the following seven nights of Hanukkah: Recite the first two prayers. Add the lighting of a new candle each night until all eight candles are lit. 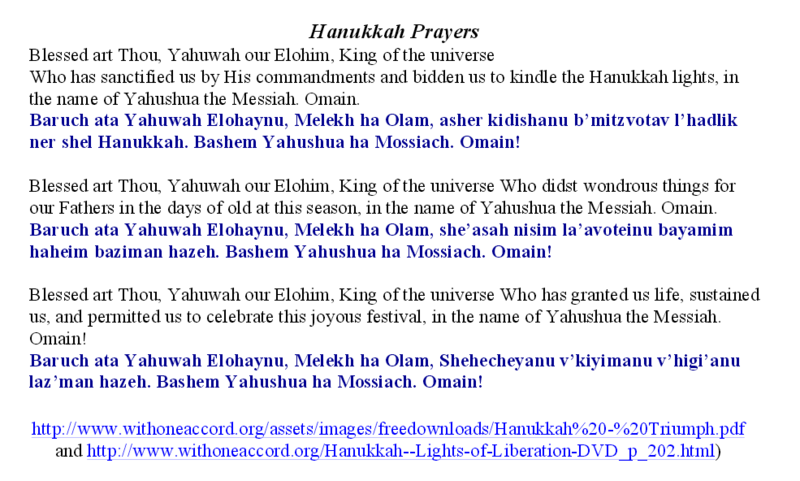 Note: Though Hanukkah is not in the Torah; it IS an Israelite celebration that pre-dates Messiah. The word “Hanukkah” means dedication. It is evident from John’s testimony (John 10:22) that Yahushua kept this celebration, set it ap art by His Presence and used it as an occasion for important teachings. It commemorates the great miracle that occurred in the days of the Maccabees (c. 164 BC) ending in the rededication of the Temple. 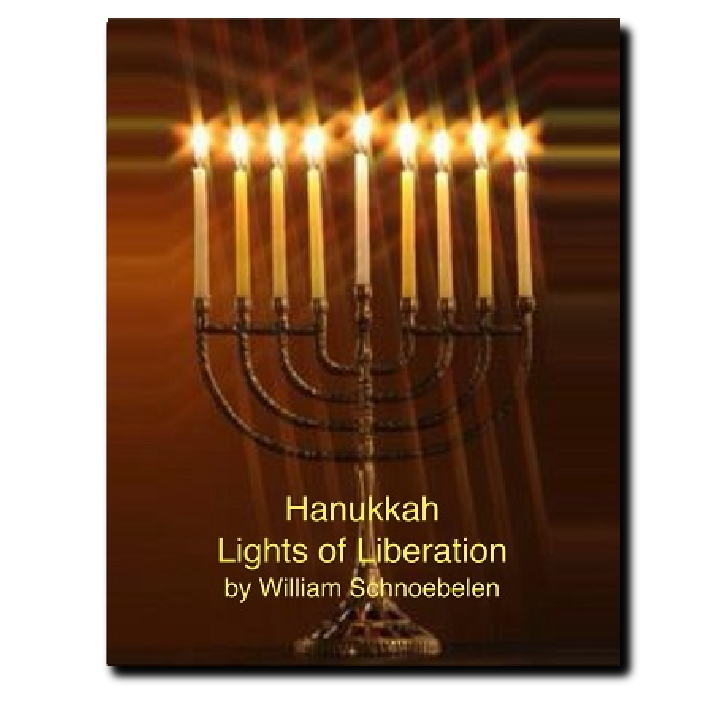 Yahushua celebrated HANUKKAH – will you celebrate this joyous, Biblical feast this year? Thanks to our Friends and Partners, we now have even more Free Resources on our website, including prayers and examples on how to celebrate Yahuwah’s Biblical Feasts! Rest assured we ALWAYS keep Yahushua Messiah as the CORNERSTONE in all we do! These new resources are meant to focus our hearts and minds on HIS Biblical celebrations so we can find strength together through His Word while living by His example! 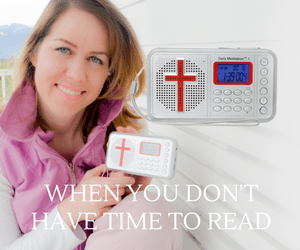 Remember, Yahushua celebrated Hanukkah (John 10:22) – and so should YOU! The following examples of prayers are given to us by Hoshana Rabbah. If you are wanting to make each night special, Hoshana Rabbah gives you some ideas of what to say for each night of Hanukkah.